The Sixteenth Session of the Coordinating Working Party on Fishery Statistics (CWP) considered that there is a need to supply existing and prospective participating organizations with information about the structure and functions of the CWP, and requested the Secretariat to prepare a paper by updating a working paper entitled "The Role and Structure of the CWP" (Doc. CWP-16/23). Since that working paper was written, new Statutes and Rules of Procedure have been adopted and these are included. 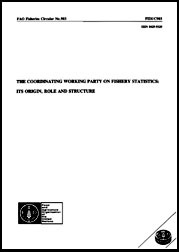 The Coordinating Working Party on Fishery Statistics: Its origin, role and structure. FAO Fisheries Circular. No. 903. Rome, FAO. 1995. 14p. This paper outlines the origin of the Coordinating Working Party on Fishery Statistics (CWP), its development and achievements, and its future role. The CWP was reconstituted in 1995 in order to allow it to better respond to increasing demands for reliable fishery statistics and coordination of regional fishery statistical programmes. The new Statutes and Rules of Procedure are presented, together with information on how new organizations may be admitted.